Former University of Utah football coach Dennis Erickson will be the head coach of Alliance Salt Lake, one of the eight teams in the startup Alliance of American Football league. Games at Rice-Eccles Stadium are set to begin in February 2019. After retiring from the University of Utah and walking away from football last year, Dennis Erickson moved to Coeur d’Alene, Idaho, started playing golf and soon realized something about himself. Erickson, who spent four seasons on the Utes’ coaching staff, will be back on the sideline at Rice-Eccles Stadium — this time as the head coach of Alliance Salt Lake, one of the eight teams in the start-up Alliance of American Football league. The league has announced franchises in Memphis, Orlando, Atlanta and Phoenix and a television deal with CBS. The 10-week schedule is set to begin Feb. 9, 2019, the weekend after the Super Bowl, and officials hope to be a springtime complement to the NFL for years to come. “I’ve had opportunities to coach in leagues like this, but this is, by far, the best and most organized,” Erickson said. 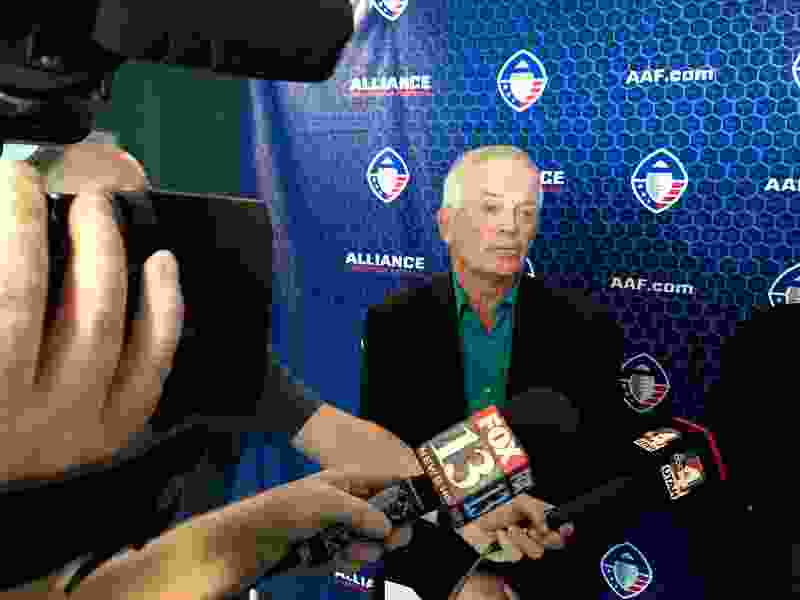 Dennis Erickson is coming back to Utah as the head coach in the new Alliance of American Football league. The league’s leadership includes former Pittsburgh Steelers safety Troy Polamalu and former Indianapolis Colts executive Bill Polian. J.K. McKay, head of the league’s football operations, declined to discuss specifics of the start-up’s financial backing during a news conference on Wednesday. All of the league’s games will be broadcast on television or streamed online, and McKay hinted at possible in-game wagering in light of this week’s Supreme Court ruling allowing states to decide whether to allow sports betting. League officials have yet to finalize the player pool or even how rosters will be assembled. McKay said, in some cases, players will be allocated based on their alma maters, meaning former Utes and BYU Cougars would suit up for Alliance Salt Lake. But not all schools will be allocated, and there will be some type of selection process to distribute the remaining players throughout the league. Erickson said he was attracted by the league’s commitment to players, including a scholarship and jobs program. But Erickson was also intrigued by the opportunity to return to Utah.